Her hands shook and filming from the street was difficult, but Amy Meyer did her best to record the scene she witnessed: A sick cow being moved by heavy equipment outside of a slaughterhouse. 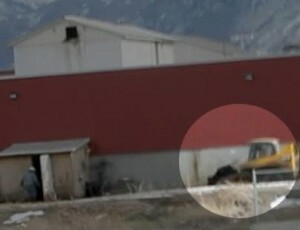 As I previously reported, Meyer drove to Dale Smith Meatpacking Company in Draper City, Utah, because she heard that anyone passing by could view the animals, and she wanted to see for herself. She filmed the scene, and was prosecuted for “animal agriculture interference” under Utah’s “ag-gag” law — the first prosecution of its kind in the nation. Meyer’s video, now published for the first time here, clearly shows that not only was she filming from public property, but she witnessed what appears to be a sick cow — known in the industry as a “downer”— being moved by a track loader outside the slaughterhouse. Video footage of similar treatment led to the largest meat recall in U.S. history after the Humane Society documented that the sick cows were entering the food supply and being fed to children. In this video, Meyer is filming the bulldozer moving the cow as she stands on the public easement. She is approached by Bret Smith, manager of the meatpacking company (and brother of the town mayor mayor, Darrell H. Smith). During the exchange, Meyer notes that she is standing on public property, and points to the barbed-wire fence. 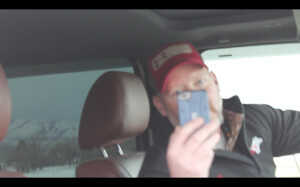 Under Utah’s ag-gag law, filming an agricultural operation is illegal if you 1) leave a recording device on the property without the owner’s consent, 2) obtain access under false pretenses, or 3) trespass. Meyer violated none of those provisions. Utah’s law is similar to a dozen other ag-gag bills that have been introduced this year in response to a series of damning undercover investigations by animal protection groups like Mercy For Animals, the Humane Society, and Compassion Over Killing. The investigations have prompted criminal charges and a massive public outcry, but rather than remedy the most egregious animal welfare abuses, the industry is trying to silence the whistleblowers. Smith: If you have something to ask me about my business then why don’t you have the balls to come and ask me. We are running a legitimate business over there. And you guys have no business recording me from anywhere. That’s my property. Meyer: Why are you concerned about being filmed if you have no problem, you think this is legitimate business? Smith: It is a legitimate business. Meyer: Then why are you concerned about being filmed? Ironically, Smith angrily says “You cannot videotape my property from public property” as he is using his own smart phone to film Meyer. When the police arrive, Meyer continues filming. Police: Whatcha taking pictures of? Meyer: I’ve just never seen what this place looks like. Police: Did you have a friend with you? Meyer: Am I correct that this is a public easement? Meyer stands her ground, and repeatedly asks if she is being detained, if the officer can show her what law she has violated, and if she can call her attorney. The police officer appears a bit flustered, and sheepishly says he will need to check her insurance. He returns to say that she is free to go, but that prosecutors will be “screening charges” to determine if she should be prosecuted. Charges were later filed. But just 24 hours after I reported the story and it went viral, they were dropped. The dropped charges were a victory for Meyer, but Utah’s ag-gag law is still on the books. And right now in North Carolina, a bill is being considered that is even more dangerous. It’s called the “Commerce Protection Act,” and it’s not limited to factory farms or slaughterhouses. It’s an ag-gag bill that applies to all industries, from fracking to Monsanto. Human Rights Watch has called the bill a threat to worker safety, environmental protections, and consumer health. Next post: Australia and New Zealand Speaking Tour!